Cell therapy could cure type 1 diabetes — if only the immune system didn't get in the way. Douglas Melton allowed himself a brief moment of celebration. After 23 years of trying, he had finally managed to grow tissue in the laboratory that could replace the cell clusters, or islets, in the pancreas that are destroyed by type 1 diabetes (T1D) — the autoimmune disease that affects two of his children. Melton, co-director of the Harvard Stem Cell Institute in Cambridge, Massachusetts, had transformed embryonic stem cells into the specialized β-cells found in islets that sense glucose and secrete insulin to help to control blood sugar1. The ramifications were huge. The ability to produce a potentially limitless supply of β-cells meant that people with T1D would no longer need to receive islet transplants from deceased donors — an option that can help only a few hundred patients per year because of the dearth of donor organs. Most of the millions of adults and children living with T1D have to monitor their glucose levels continually and inject themselves with insulin every day. But after throwing a party for his lab group — at which Melton gave everyone blue winter hats emblazoned with his signature 'Skittle diagram', a schematic of colourful circles showing the developmental progression from stem cell to β-cell — reality set in. Even though he could now grow millions of β-cells in a single flask, an achievement for which he would be recognized with the 2016 Ogawa-Yamanaka Stem Cell Prize, Melton now faced a new challenge: how to protect implanted cells from the autoimmune attack that had destroyed the original cells. “Suddenly that problem loomed very large,” says Melton, “because now it was the problem. To prevent rejection of the islets — both because the cells come from unrelated donors and because of the recipients' islet-directed autoimmunity — patients have to take life-long courses of immune-suppressing drugs. But these medicines come with serious side effects, including increased risk of infection and cancer. Melton wanted to avoid these agents, which meant he needed some sort of device or material that would shield implanted β-cells — lab-grown or donor — from the immune system, while allowing nutrients such as glucose, insulin and oxygen into and out of these cells. “The dream is to be able to build some kind of immuno-isolation device that will allow people to get the benefit of the cells without having to suppress their immune system,” explains one of Melton's collaborators, Daniel Anderson, a bioengineer at the Massachusetts Institute of Technology (MIT) in Cambridge. That dream has eluded academics, entrepreneurs and big pharmaceutical companies for more than 40 years. Thanks to the new-found ability to make β-cells from scratch, however, researchers now have a consistent and reliable cell source. This means that they can methodically compare different encapsulation systems side by side, rather than tinkering through trial and error with whatever leftover β-cells they could get their hands on — the “dregs of material”, as Melton puts it. And this rational engineering approach is leading to improvements in the design of both large and small cell-safeguarding techniques. For many years, the most popular capsule material for transplanted β-cells has been a seaweed extract called alginate. It's been tested in rodents, dogs, monkeys and even humans in a few pilot clinical studies. The human trials showed that the material was safe, even in people who were not taking immunosuppressant drugs. But the therapeutic benefit was marginal because, within weeks of implantation, the alginate would usually begin to attract immune cells such as macrophages and neutrophils. This led to the deposition of fibrotic scar tissue that gummed up the capsules, choking off the cells inside. This type of immune reaction was different from the one that originally destroyed the patients' β-cells, but it was equally damaging to the prospects of this therapeutic approach. Seeking a derivative of alginate that could evade immune detection altogether, Anderson teamed up with his MIT colleague Robert Langer. The researchers systematically screened close to 800 chemical offshoots of alginate in mice. They found one variety — triazole–thiomorpholine dioxide alginate — that seemed to go completely unnoticed by the immune system2. In September 2016, the US Food and Drug Administration approved the first medical device that can both supply insulin when blood sugars are high and shut off insulin delivery when sugar levels start to drop, with little input from the patient. This artificial pancreas system — the MiniMed 670G from Medtronic, a medical device company headquartered in Dublin — combines two devices, one that monitors blood glucose levels and one that infuses insulin, with an algorithm that automates the delivery of insulin. The bulk of the MiniMed set-up, including most of the electronics and the insulin pump, sits outside the body in a mobile-phone-sized device (pictured) that people can carry in a pocket or wear on a belt. This device is attached to a tiny tube that is inserted beneath the skin. Much of the glucose-monitoring system is found in a patch worn on the surface of the abdomen, but this is also connected to a subcutaneous sensor. The components that go into the body are prone to fibrotic immune reactions, and thus currently need to be replaced every few days. Coating the glucose sensor or the insulin-delivering catheter with a less immune-reactive material, such as the one being developed by Sigilon, a start-up in Cambridge, Massachusetts, could make the components last longer. But patients still need to tell the MiniMed (and similar technologies) when they've exercised or eaten — and no device can offer blood-glucose control that's anywhere near as tight as that provided by the body's own cells. That's why Douglas Melton, co-director of the Harvard Stem Cell Institute in Cambridge, Massachusetts, who has two children with type 1 diabetes, continues to work on a cell-replacement therapy for the disease that would add back the insulin-producing β-cells that are lost. His benchmark for success: “It has got to make my children have a life in which they don't think any more about what they're going to eat or how much they've exercised any more than you and I do.” E.D. In the microencapsulation field, size matters. In tests with the super-alginate, the MIT team used capsules with a diameter of 1.5 millimetres, which it has demonstrated are much less immunogenic than the 0.5-mm capsules that researchers in the diabetes cell-therapy field have conventionally used4. But a tripling of the diameter means a nearly 30-fold increase in the volume of each capsule. And given the large number of capsules required to contain the hundreds of millions of β-cells needed to control a person's diabetes, there are few places in the body where the therapy could be implanted. The capsules probably won't fit under the skin or in another easily retrievable location — and regulatory agencies have insisted, as a safety measure, that any stem-cell-derived diabetes therapy implanted in patients should be fully recoverable. That's why Alice Tomei, a bioengineer at the University of Miami in Florida, has developed what she calls a “shrink-wrapping technology”, which uses microfluidics to apply a thin biocompatible coating to clusters of cells to make the smallest possible capsule — one that's only about 0.2 mm across5. Her material of choice, polyethylene glycol, may be more immune-reactive than Sigilon's super-alginate, but Tomei argues that her thinly wrapped cells will be small enough to implant in more accessible spots in the body. Another of Semma's collaborators is Beta-O2 Technologies, a company based in Rosh-Haayin, Israel, that has been working on encapsulated cell therapies for T1D for more than a decade. As the name suggests, Beta-O2 was created to develop a way of delivering oxygen to implanted cells — a problem that's especially acute with larger macroencapsulation devices, which impose a larger barrier than capsule technologies between the blood supply that carries the oxygen and the energetically hungry β-cells. The company's initial prototype was a chamber about the size of a hockey puck that is implanted under the skin and requires daily injections with oxygen. As proof of principle, Beta-O2 tested this device by loading it with donor islets and implanting it in five patients in Germany6 and Sweden. The results were encouraging: the cells remained alive and healthy for months. Beta-O2 is working on its second-generation device, which, according to chief executive Yuval Avni, will be able to hold more cells and require oxygen injections only once a week. But the company needs a more reliable cell source, and Avni has high hopes for Melton's cells. Melton's original recipe for making β-cells was cumbersome. It took 35 days of carefully swapping 5 different growth media and mixing in 11 different factors, including sugars and proteins. According to Felicia Pagliuca, a former postdoc in Melton's lab who now leads cell-biology research and development at Semma, she and her team have dramatically streamlined the protocol. “We are leaps and bounds further from where we were,” she says. And they have a strategy for getting the cells into clinical trials, even before an encapsulation device is ready. 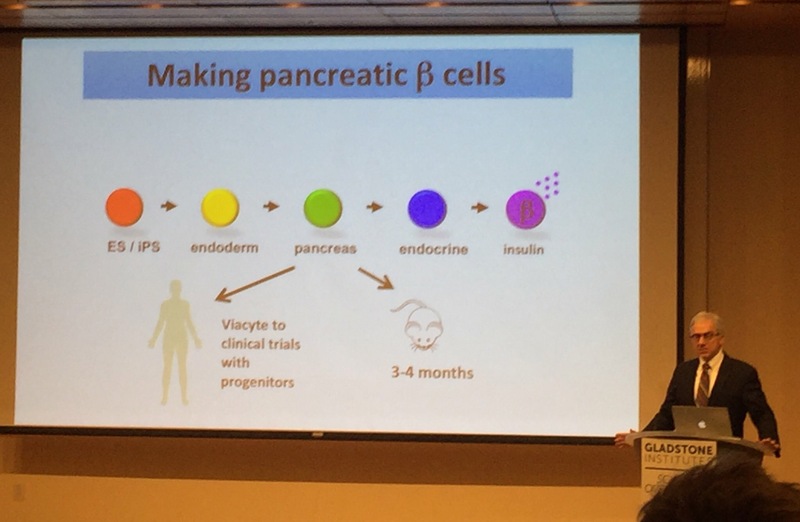 The plan is to make β-cells from induced pluripotent stem cells created from people who need insulin, but whose bodies don't attack their own cells, which happens in people with T1D. Since there would be no tissue mismatch or chance of autoimmune reaction, those cells could then be implanted back into the patients without any immune-suppressing drugs or barrier technologies. Semma is focused on three patient populations, none of which have autoimmunity: people with a form of type 2 diabetes called lean diabetes, in which β-cells have stopped working; individuals who have had their pancreases surgically removed because of problems such as chronic inflammation; and patients with an insulin-dependent form of cystic fibrosis. The company hopes to test its cells in one of these populations in three to four years; trials with any sort of encapsulated device for people with T1D will follow at a later point. But this means that Semma might be playing catch-up with its competitor ViaCyte. Earlier this year, the firm absorbed one of its chief rivals, a division of Johnson & Johnson called BetaLogics, while also announcing promising early data from the first human trial of an encapsulated stem-cell-derived product for T1D. ViaCyte's PEC-EnCap device is made up of a semi-permeable pouch, about the size of a sticking plaster, that contains thousands of pancreatic precursor cells, each derived from embryonic stem cells. The company uses precursor cells, rather than fully mature β-cells, because these cells are hardier under the low-oxygen conditions that follow implantation, when the packets haven't yet integrated with the blood system. Over the past 2 years, ViaCyte has implanted its devices under the skin of about 20 patients without immunosuppression. In many recipients, the pancreatic precursors have grown into insulin-producing β-cells — although these cells often die after a few months, owing to a fibrotic immune reaction on the device exterior. “That's a proof of feasibility that this is achievable, but we still have a lot of work to do,” says ViaCyte's chief executive, Paul Laikind. “The goal now is to reduce or delay that foreign-body response long enough for the cells to engraft.” ViaCyte hopes to achieve this by modifying either the encapsulation device or some other aspect of the treatment protocol before it moves into the next phase of testing with a full therapeutic doses of its product. Pagliuca, F. W. et al. Cell 159, 428–439 (2014). Vegas, A. J. et al. Nature Biotechnol. 34, 345–352 (2016). Vegas, A. J. et al. Nature Med. 22, 306–311 (2016). Veiseh, O. et al. Nature Mater. 14, 643–651 (2015). Tomei, A. A. et al. Proc. Natl Acad. Sci. USA 111, 10514–10519 (2014). Ludwig, B. et al. Proc. Natl. Acad. Sci. USA 110, 19054–19058 (2013). Elie Dolgin is a science writer in Somerville, Massachusetts.